There’s no way you could escape them. They were there, in every corner, every alley and even underground. It’s almost impossible to not find yourself being offered a terracotta warriors T-shirt or statue or keychain when you were walking around the city. 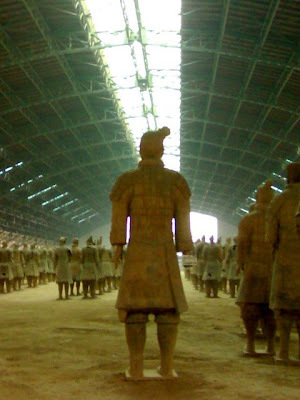 Xi’an is a terracotta warrior's mega business empire. Made me sort of wonder, what did the locals do for business before 1974, when accidentally the buried warrior dudes was found. Our journey continued from Chengdu. After an early one and a half hours flight to Xi’an, we found ourselves sitting cramped in a aged taxi with an aging driver and stone age temperament. With the help of my now dog eared phrase book and clear address, both in Chinese characters and pin yin, he drove us violently to our hostel. After a loud screeching and a sudden halt, we found ourselves standing in what seems like an old mansion, guarded by two verocious looking quilin or lions. Our hostel in Xi’an, similar with the city itself was simply a piece of history. After settling in, we decided for our mission of the day. A brief interruption, if you please. I know I’ve just been in China for four days, and I know when one’s travel, one should eat what the locals eat. However, at that time I really feel I had enough of noodles and pao. So, our mission of the day was…having a lunch at Subway. For the first time, ordering food in China was so easy, it almost put me to tears. Fueled by long and thick tuna sandwich, we walked around the city. We caught a glimpse of the Drum Tower and nearby Bell Tower, also went to the Temple of the City Gods and the market inside. By recommendation from a friend, I took my numb-by-cold Mother to the Muslim Quarter. I got the feeling that the market was built especially to fool tourists. How could you explain the logic of haggling 200RMB T-shirt to become 40RMB? I don’t think I’ve ever been haggling that hard in my life. And really, if it was for me, I would just leave the shop when the lady said 200RMB. But it was her who kept harassing us to buy, I give you good price-la, how much you want ha? We ended up with few T-shirts for gifts and weariness, a mixture of emotion came by extreme bargaining and severely cold weather (7°C). We spent the night at the hostel. To chicken to went out (-2°C) except to buy a bottle of Tsingtao to kept me warm in a convenience shop nearby. It still didn’t dampen my spirit. I was obsessed with those dudes. Ever since watching the excavation in National Geographic years ago, I swore myself I would go there someday. After a bus ride (7RMB), we finally made it to Bingmayong or officially known as The Museum of Terracotta Warriors and Horses of Qin Shi Huang (95RMB). It’s a vast complex, almost like a city. It took us 15 minutes walk to finally arrived to the pits which hosted the warriors. One thing that caught my eyes are the amount of professional tour guide available for hire (another 100RMB). They fussed over us with negative sentiments like: “Oh, it’s very very big inside. You could get lost and you’ll miss a lot of things if I’m not there to guide you.” Frankly speaking, it was a bit annoying. This is what you should do when you get inside (and waved goodbye to the guides). You will find three pits and a museum. Start with the smallest pit, No.3. There was not much explanation inside (obviously), so either you had your research before coming here or rent an audio guide. Otherwise, you’d only see crumbling pottery, down in a big rectangular ditch. Pit No.3 was filled with high ranking officers although when I was there, the warriors seemed to be fighting a war somewhere since there was only few that could be found. Most are in the state of crumbling to pieces or headless. I think the fact that they even managed to survived two thousand years was amazing. Not much could be seen in Pit No.3, except if you want to have your face immortalized in a 3D terracotta warrior picture. Pit No.2 is bigger than the previous pit. It host similar crumbling statues and obviously hasn’t been fully excavated. 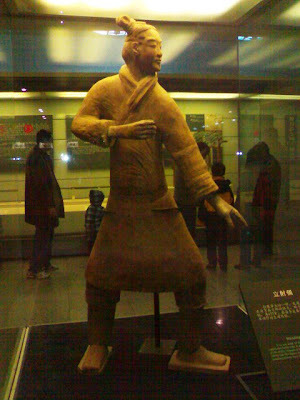 They beauty of this pit is you can see few terracotta warriors in their best condition up close. There was a general, a kneeling archer, a cavalryman and his horse and some other things. The details was remarkably meticulous and I read that none of the terracotta warriors found has the same faces. It was said that each warrior is an image of its own maker. We entered the largest pit as the grand finale. Pit No. 1 was an enormous hangar with the best natural lighting. It supposed to be the climax but at the moment I were there, a work was being done at the place. I will just say that it wasn’t what I had in mind. I sort of expecting more exciting climax. The guides talking loudly all around me were not helping either. On our way back, another 15 minutes of passing through food stalls and souvenir shops (guess what they sell!) later, we arrived at the parking lot. The drive back to the city took longer with the traffic. It was four in the evening when we got back to town. Xi’an is a beautiful city. I adore the old wall (where you can walk or ride around with bike for two or three hours), the gentrified districts and the Muslim Quarter. Everywhere I walked, I know I am walking through history. What I don’t like is this tourist inferno, this obsession with anything terracotta warriors. I wish I have more time to find the real beauty of Xi’an. I know it’s there but it was so difficult to find, being buried by layers and layers of terracotta warriors paraphernalia.